Premo’s unique 3"-wide foot ring is wider and sturdier than traditional steel rings for an added sense of comfort that you can really rest your feet on. The full sized 19"W × 17"D × 3" thick molded foam upholstered seat is contoured for added comfort. 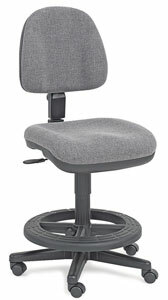 The smooth-action gas cylinder mechanism adjusts the seat height from 24" to 29". The 16"W × 14"H × 2½" thick backrest provides solid orthopedic spine support. The Alvin Premo chair also includes a sturdy black metal frame, reinforced 5-star, non-tip fiberglass base and double wheel "hood" design casters. Assembly is required.